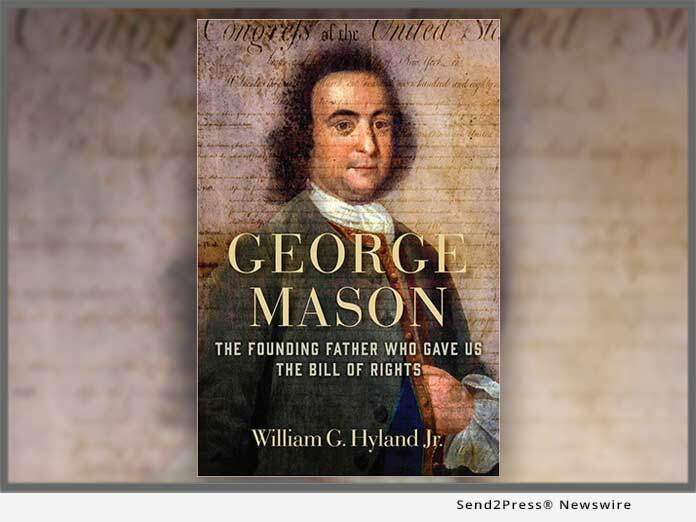 DELAND, Fla., Apr 02, 2019 (SEND2PRESS NEWSWIRE) -- George Mason was a short, bookish man who was a friend and neighbor of athletic, broad-shouldered George Washington, says author William G. Hyland, Jr., in his new book, "George Mason: The Founding Father Who Gave Us the Bill of Rights" (ISBN: 978-1621579267; Regnery History). Unlike Washington, Mason has been virtually forgotten by history. But this new biography of forgotten patriot George Mason makes a convincing case that Mason belongs in the pantheon of honored Founding Fathers. Trained in the law, Mason was also a farmer, philosopher, botanist, and musician. He was one of the architects of the Declaration of Independence, an author of the Bill of Rights, and one of the strongest proponents of religious liberty in American history. In fact, both Thomas Jefferson and James Madison may have been given undue credit for George Mason's own contributions to American democracy. "George Mason: Author of the Revolution," is a welcome contribution to the literature about one of the most important-yet least known-founders of the American Republic. Drawing heavily upon original documents and research, author Hyland has produced a valuable work which should put all of us in his debt. Highly recommended for scholars, students, and the general public alike. -- Historian and Author, Prof. Robert F. Turner, University of Virginia School of Law; SJD Distinguished Fellow Center for National Security Law. William Hyland's eloquent work is a welcome addition to the growing library of books about George Mason, author of the Virginia Declaration of Rights. In this new book, Mason's often under-appreciated contributions to the Revolutionary period and to the US Constitution, as well as his relationships with family and contemporaries, are explored and examined in a personal and engaging fashion. Anyone interested in Mason and the founding of the United States would enjoy reading this intimate portrait of one of America's greatest statesman. -- Historian Scott Stroh, Executive Director of Gunston Hall. George Mason has always been considered one of the Founding Fathers, but one who stood just outside the main spotlight. Now, fortunately, William Hyland has moved Mason into that spotlight by his illuminating and carefully researched biography of this intriguing figure. Hyland provides a scholarly portrait of Mason with new emphasis on the complete Mason-his wives, children, friends, business affairs, physical ailments, and his treasured Gunston Hall-with this splendid and balanced new chronicle. Hyland's clear-eyed review will enlighten anyone seeking to understand the special role that Mason played in breaking from England and creating a new nation with a governing structure that rests on safeguarding human rights." -- Historian and Author Arthur Downey, The Creole Affair: The Slave Rebellion that Led the U.S. and Great Britain to the Brink of War (2014) and Civil War Lawyers: Constitutional Questions, Courtroom Dramas, and the Men Behind Them (2011). Thomas Jefferson called George Mason "the Cato of his country," and the renowned biographer of Jefferson, Dumas Malone, claimed that "more than any other single American...George Mason may be regarded as the herald of this new era." Such praise and acclaim was also voiced by James Madison, George Washington, and a host of American Founding Fathers. But Mason's name is hardly known today, and the studies of his life and thought are few. But William Hyland in this seminal biography has set the record straight. In close, scholarly examinations of Mason's writings, Hyland demonstrates the profound influence he had on Revolutionary America's history and thought; and he does so in a way which presents to us the man we have forgotten. Textual study and biography are hand in glove. The former sheds great light on Mason the fiery opponent of slavery, the man of unbending principle who voted against the Constitution though it cost him his friendship with his life-long friend and neighbor, George Washington, and who shunned public life out of an intense devotion to his family, home, and fields. William Hyland set the scholarly bar very high in this great and much needed book, and we are in his debt for seeing his task through successfully. -- William McF. Wilson, Ph.D Professor Emeritus, University of Virginia; Director of Graduate Studies at the Jefferson Scholars Foundation. William G. Hyland, Jr., a native of Virginia, received his B.A. from the University of Alabama and a J.D. from Samford University's Cumberland School of Law. A former prosecutor, Hyland is a trial lawyer with over twenty-six years of litigation experience. His publications have appeared in the law journals of the University of Texas and University of Richmond, as well as in the American Journal of Trial Advocacy, including his article, "A Civil Action: Hemings v. Jefferson." Before law school, he worked with a Top Secret security clearance for the Arms Control and Disarmament Agency in Washington, D.C. Hyland serves on Florida's Judicial Nominating Commission and is a member of the Virginia and New York Historical Societies. He now lives and writes in Florida. News Source: William G. Hyland Jr.